Vietnam’s Communist Party is concerned about its grip on power amid deteriorating regional relations. With the situation in the South China Sea still delicate, the Communist Party of Vietnam (CPV) sent its envoy, Le Hong Anh, to visit China at the invitation of the Chinese Communist Party (CCP). As the CPV’s representative, Le’s main purpose was to restore the relationship between the two countries and their ruling communist parties. Given the foreign affairs model under communism, most observers view party diplomacy as more important than official visits. For China, smoothing tensions with Vietnam is part of a larger strategy to decrease pressure created by the U.S. rebalance to Asia. For Vietnam, as with many ASEAN countries, the priority is to hedge against Chinese assertiveness. Vietnam has tried to balance China with the cooperation of the West in terms of security, but it still needs Chinese economic largesse. For the CPV however, there is a more important reason to ease the conflict: to survive and maintain its grip on power. In recent years, facing domestic and international pressure, Vietnam has begun to implement political reforms such as the direct and competitive election of Parliament. Nonetheless, according to Freedom House, the country’s performance on civil liberties and political rights is still very poor and appears to be stagnating, something that could be attributed to the CPV’s continued tight grip on power. Even with modest advances in liberalization and democratization, Vietnam has little in common with Western political standards. As engagement with the West deepens, however, calls for change are growing louder. For instance, the former Vietnamese ambassador to Beijing, Nguyen Trong Vinh, has argued that the CPV should abandon socialism in favor of nationalism and democracy. 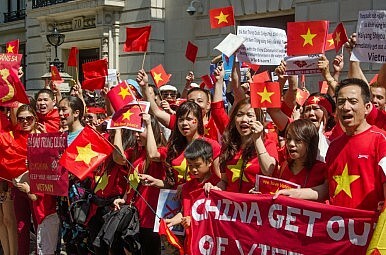 In the meantime, many Vietnamese have criticized the country’s economic and political dependence on China. Enmity towards China, some of it historical, runs deep. Anti-Chinese sentiment features frequently in Vietnamese society, such as the blocking of the bauxite mine and high-speed railway system with China, along with the anti-China riots this May. These are events the CPV cannot readily ignore. Still, with emotions running high, Vietnam has to face the fact that it continues to rely on Chinese investment and imports. And trade with China has become a primary engine of economic growth, which in turn helps keep the CPV in power. The territorial disputes notwithstanding, the CCP doesn’t want to see the CPV collapse and replaced by a nationalist party. All of which means that it is not surprising that China removed its oil rig, and that CVP returned the favor by way of this latest meeting – maintaining cooperative relations is just too important for the countries. Lucian T. H. Hsu is the first Ph.D. from the Graduate Institute of International Affairs and Strategic Studies of Tamkang University of Taiwan. He was the visiting fellow in Western Michigan University of US and Monash University of Australia. He is now a freelance writer and researcher. Hanoi is having to walk a careful line in its relations with China and the U.S.